Everyone talks about strategy, means of achievement, vision, narrative, "begin with the end in mind", even [gasp!] goals. How come this quote, courtesy of "hearding cats", still rings true? Part of the answer, of course, is the popularity of "evolving needs" driven by the operating customer/user. To wit: whatever happened to "the stake in the ground", aka: baseline? Question: is evolution of the end-game just that: evolution; or is "flip flopping"? I suppose it depends on how black and white is the evolution. I've described what Machiavelli has said -- in past posts -- as: "Any ankle biter can say no; it takes a committed leader to say yes, and make it stick!" So, apart from the scourge of the ankle biters, what does Machiavelli portend for the project office? Or, for the team leader, or even a team member, who wants to "change the process"? Answer: lots of resistance from the "old order"; few climbing out on the limb with you as the "new order"
Indeed, what if the "process change" is to do away with the need for the process? Who's not heard this one (*)? Instead of investing to make the trains run on time, why not do away with the trains?" Instead of investing to make vehicle drivers better at driving, why not do away with drivers? So, now you're in the project office inventing the "computer science" of driving decisions, such as the sundry moral questions of who to save in an accident situation: you, or the person your car is going to injure? Your office is now the "reformer" Machiavelli spoke about: lots of enemies, as in the hundreds of thousands of professional truck and taxi drivers (to say nothing of Uber and Lyft) you will put on the bread line ... talk about enemies!! Making it simple for the user/customer/beneficiary often requires a lot of 'backstage' complexity. Ask any system engineer. 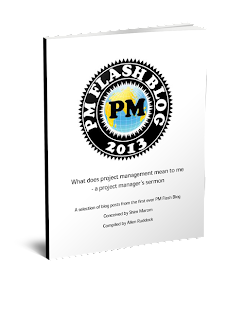 Project managers beware! Often, the sponsor's vision is simplicity itself. And, the sponsor makes resource commitments on their idea of value. But the sponsor's value allocation of resources may not comport with the resource allocation needed to make project outputs simple for the user, customer, or beneficiary. First, an interval of what? Would you believe the possible value of a random variable? And which would that be? Answer: the sample average of velocity, call it V-bar. And V-bar being a random variable, it has a distribution that prescribes how likely is any particular value of V-bar to fall into the interval of interest, ie, the confidence interval. Second, we don't actually know the distribution of V-bar and we don't know the distribution of the population V (velocities), so we can't know what the next V is going to be, or its likelihood. Ideas about extreme risk management have been around a long time. No news there, so let's press on. Here's a working definition: Extreme risks are those for which the consequences are nearly irreversible, and the impact is near-catastrophic. And, fortunately, in most cases, the likelihood of the event is low. Because the expected value is nearly zero, but the threat so high, people are willing to pay high premiums to make the problem go away. Thus is born the high risk insurance industry -- high premiums for low expected value!. As long as the frequency of events is small, you pay and pay and they haul it to the bank. Pushing risk off to high-risk underwriters--most famously Lloyds of London--has been a traditional mitigation. But for some projects and some circumstances, insurance is not practical. There are a couple of principles that guide action. --- Probably the oldest is something called the Precautionary Principle. In a few words what it means is that burden of proof about consequences is shifted to the advocate of taking action to do something (like: there's a risk; buy insurance), and away from the pessimist who is blocking the action (like: insurance is too expensive, let's risk it, or: it'll never happen). One project example is the decision in Houston regarding the return of Apollo 13 after the explosion that damaged the spacecraft. Gene Kranz, lead Flight Director, essentially turned back the advocates for a quick return and directed an orbit around the moon for the return. The consequences of an early return, if not successful, were fatal since the moon lander lifeboat had to be abandoned if the early return option was selected. A good description of the decision making process is found in Kranz's book: "Failure is not an option"
(advocate) If there is even 1% chance of a horrific event happening, then consider it's expected value as a certainty. A certainty? How does that compute? Math: nearly 0 x nearly Very Large = nearly 1. Ergo: if the outcome is so horrific, you have to do something, even if the likelihood is very low. Caution: such logic can lead to many unbudgeted and unexpected consequences! And, "enculturation" is my new word. I'm proud to use it. It means "to get with the program" and absorb the culture! We see that robot headline repeatedly. What's the antidote? Where possible, practice creativity, even if you yourself don't think of yourself as creative. And, then of course, there's this advice: consistently work on your personal knowledge base; it's part of your job description. Some leaders famously don't read, but among millions there are very few non-readers who are successful. Sometimes we lose sight of individuals in the never ending grasp for the big picture. So, it is nice to be able to thank Peter H. for his compliment. So often, the annual statement from the publisher is "lifeless" -- though the check is nice. I read your book Project Management the Agile Way : Making it Work in the Enterprise. It is great. Project Manager in retail，store and payment system implementation. And, did I mention the book is out in a second edition. Same title -- almost. The publisher added "second edition" to the subtitle. To all the other many readers, thanks for making the book a success!